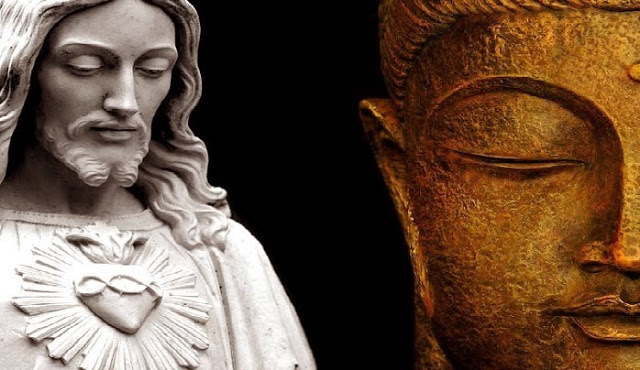 Home » other » Why are Christians Turning to Buddhism? A small but growing number Christians in the West are turning to Buddhism for spiritual guidance. Many are reading books about Buddhism, and some are also meditating, participating in Buddhist retreats, and studying under Buddhist teachers. They are drawn to Buddhism’s emphasis on “being present” in the present moment; to its recognition of the interconnectedness of all things; to its emphasis on non-violence; to its appreciation of a world beyond words, and to its provision of practical means — namely meditation — for growing in one’s capacities for wise and compassionate living in daily life. As they learn from Buddhism, they do not abandon Christianity. Their hope is that Buddhism can help them become better Christians. They are Christians influenced by Buddhism. 01. Julia is typical of one kind of Christian influenced by Buddhism. She is a hospice worker in New York who, as a Benedictine sister, turns to Buddhism “to become a better listener and to become more patient.” As a student of Zen she has been practicing zazen for twenty years under the inspiration of the Vietnamese Zen teacher, Thich Nhat Hanh, whose book Living Buddha/Living Christ gave her new eyes for Christ, proposing that Jesus himself was “mindful in the present moment.” She practices meditation in order to deepen her own capacities for mindfulness, particularly as it might help her be more effective in her life’s calling. As a hospice worker she feels called to listen to dying people, quietly and without judgment, as a way of extending the healing ministry of Christ. Like many people in consumer society, she sometimes finds herself too hurried and distracted, too caught up in her own concerns, to be present to others in patient and healing ways. She turns to Zen practice because it has helped her become more patient and attentive in her capacities to be available to people in a spirit of compassion. 02. John, too, is a Christian who practices meditation, but for different reasons. He suffers from chronic back pain from a car accident several years ago. He has turned to meditation as a way of coping more creatively with his pain. “The pain doesn’t go away,” he says, but it’s so much worse when I fight it. Meditation has helped me live with the pain, instead of fighting it all the time.” When people see John, they note that he seems a little more at peace, and a little more joyful, than he used to seem. Not that everything is perfect. He has his bad days and his good days. Still, he finds solace in the fact that, even on the bad days, he can “take a deep breath” and feel a little more control in his life. atmosphere of church seems to discourage, rather than encourage, the spirit of enquiry and questioning that are so important in the scientific life. Jane appreciates the fact that, in Buddhism as she understands it, this spirit is encouraged. 06. Sandra is a Roman Catholic nun in Missouri who leads a retreat center. Twelve months a year she leads retreats for Christians, Catholic and non-Catholic, who wish to recover the more contemplative traditions of their prayer life and enter more deeply into their interior journey with God. At her workshops she offers spiritual guidance and introduces participants to many of the mystics of the Christian tradition: John of the Cross, Teresa of Avila, Meister Eckhart, Hildegard of Bingen. Even as she does this, she herself is on the very journey to God, and she makes this clear to people who come her way. As you listen to their stories, perhaps you hear your own desires in some of them? If so, you have undertaken an empathy experiment. You need not be “Christian” or “Buddhist” to do this. There is something to learn from them even if you are not religious at all. Don’t we all need to live by dying? Don’t we all need to listen better? Don’t we all need to inquire and seek truth? There is something deeply human in their searching, and deeply human in our willingness to learn from them, even if we don’t share their faith. And even if we do.